It is only in very recent years that a realization has dawned on home vegetable gardeners that sweet potatoes can be successfully—even easily—grown outside the deep south, even up to the far north. That said, though, sweet potatoes are, to our minds, a marginal crop. They are, much like winter squash, something of a one-trick pony in the culinary sense, yet they take up quite a bit of garden space that could be used for far more useful crops. But, because if one has space galore, one can essay a modest crop, because there are a few things one can do with them other than drizzle melted butter and brown sugar over them (they respond well to being paired with tart tastes, such as sorrel, or even—we saw such a recipe on the net—grapefruit). Note that when we say they can be grown successfully in the North, that doesn’t mean you can just plunk them into the ground and wait: you need to take measures. That will, for sweets, probably mean, in this climate, setting up a “growing tunnel” of at least row cover, or maybe even transparent plastic sheeting. You need to get the daytime temperatures up, but even more to keep the nighttime temperatures from dropping too much. Sweets apparently need about 1,200 “heat units” to grow properly. A “heat unit” is degrees the 24-hour average temperature exceeds 55. If, for example, your daily high was 80° and your nightly low was 50°, your daily average was 65° (80+50 / 2), so your heat units for that day were 10 (65 - 55). To grow sweets, you’d want a daily average over their full growing season of 10 to 15 heat units, meaning a daily 24-hour average temperature of 65° to 70° throughout that growing period—and in the North, you aren’t going to get that in the open air. Hence, the need for “grow tunnels” or something of that sort—and, of course, black plastic mulch and drip irrigation. (So are these guys really worth that much effort to you?). Sweet potatoes normally grow on trailing vines that quickly cover the soil, rooting at the nodes along the way—but there are “bush” varieties available for when space is limited. Though “sweets” are far and away more common and popular in the south of the U.S. than up north, there are, as noted earlier, now cultivars that do well even up here. Take a look at the list of varieties on the Sand Hill Preservation Center sweet-potato offerings page—225 types! And some of those will be suited for northern gardens (they used to break those out separately, but alas, no longer). Nowadays, seedsmen’s catalogues contains lots more options for almost every vegetable than was the case not very long ago. Without looking hard, we found more than a dozen cultivars of sweets on offer. But we again run into the problem of “days to maturity” labelling (analogous to that for peppers or beans): what “maturity”? One vendor was at least decent enough to say 90 days “to ‘baby’ sweets”; how many more, one must wonder, casually fling about “90 days” when that is not the days to true, full maturity? The best reference we could find was a 2013 study by the University of New Hampshire of over 18 cultivars for possible use in northern New England, which certainly represents a good test case for would-be northern-tier growers of sweets. While productivity varied somewhat from year to year, they noted that “flavor ratings were consistent between years.” The flavor champs were Covington, Georgia Jet, and Vardaman. Of those, the only one with a “high” yield-potential rating was Covington. So that becomes a no-brainer, if slips for that cultivar can be found; and yes, we did find several sources, so that’s that. Oh, and other university sources say it stores well. Ta da. Incidentally, we have had it pointed out to us that the leaves of the sweet-potato plant are also edible. That might be worth looking into. Sweet potatoes are invariably grown from “starter” plants called slips, which you receive from your chosen seedsman shortly before planting time. Take care to obtain slips only from seedsmen with certified disease-free roots. Despite the urgent need for growing time, it just doesn’t do to get sweets into the ground before that ground (much less the air) temperatures get well into the warm-season range. Since you’re only going to grow these successfully if you’re using such augmentations as grow tunnels and plastic mulch, don’t rush them out. If we take our mid-season high day, July 22nd, and work forward and backward by 45 days, half of the nominal 90-day growth period, we get transplanting out on June 7th and harvest around September 5th. On June 7th, our average high is 77°, and on September 5th it’s 77°. The coldest overnight low in that span is 38°, though 40° is more representative of the early and late lows. Most sources say an air temperature of 65° or over suffices, though broadly, the warmer, the better. That’s acceptable: the issue is overnight lows. Sweets don’t like it if it gets below about 60°, a night-time temperature we never even approach (our warmest overnight low is about 50°); so, we have to rely on aids of various sorts, from things like Walls o’Water to plastic mulch to row cover or tunnels, and like that to keep those in-bed lows at 60° or over. Ain’t we got fun? Sweet potatoes prefer well-drained, loamy to sandy soil. Heavy clay soils are not good them—the potatoes can end up small or misshapen. Even using certified disease-free slips, it is wise to rotate their garden location annually. Use row cover to help with warmth. Water well, but: do not water during the last 3 to 4 weeks before harvest, so as to protect the developing roots (the “potatoes”). Keep an close eye on the temperatures under your dome or tunnel: peaks over about 95° actually start to slow down sweet-potato growth. Try to keep the daily maximum as high as possible but not over than 95°. Dig your crop at about the time of the first fall frost. As with true potatoes and other “root” crops, take great care not to cut, bruise, or otherwise damage the roots. Sweet Potato Growing Information - a gold mine of valuable information from the sweet-potato catalogue of the estimable Sand Hill Preservation Center. 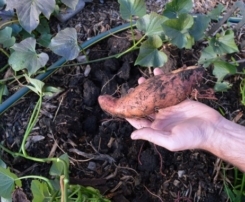 Tests discover the secrets to a successful sweet potato crop - fascinating results from a Master Gardeners test in California. Growing Sweet Potatoes in Cold Climate - what it says; the Covington is cited. 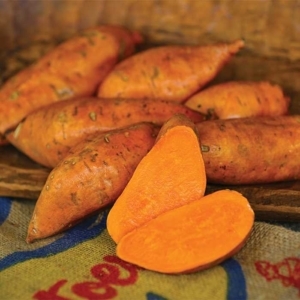 The sweet potato is not at all the same thing as the yam, though “yam” is very commonly taken to just be another nickname for the true sweet potato. True sweet potatoes are a member of the Convolvulaceae, or convolvulus, family, which includes few other edibles, but does include the flower Morning Glory. We try not to re-invent the wheel, so here is a link to a comprehensive history of the sweet potato. “Sweet potato candies, ice cream, cookies, and related delicacies prepared from this vegetable are not yet widely known, but they are surprisingly good.” Or so says one site. You loaded this page on Friday, 19 April 2019, at 16:20 EDT. It was last modified on Sunday, 3 February 2019, at 04:58 EST.